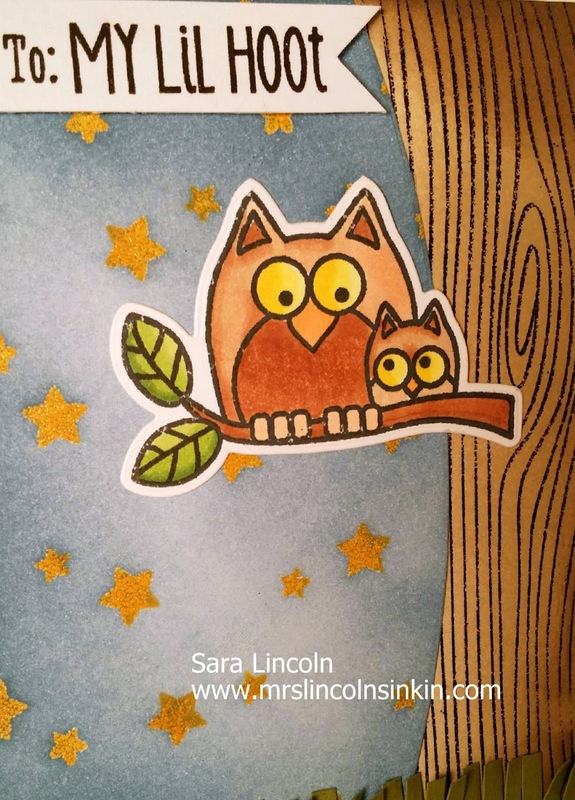 Mrs. Lincoln's Inkin: Emma is 3!!!! Hi there friends!! Welcome to Mrs. Lincoln's Inkin'!! 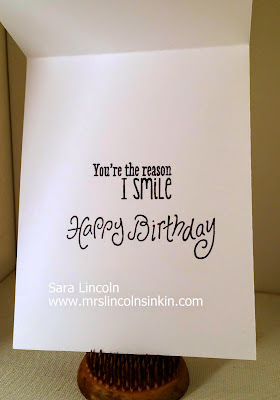 Today's post is of the birthday card that I made for my little Bean (that is my nickname for our daughter, lol). Today (November 12th) is her 3rd birthday!! 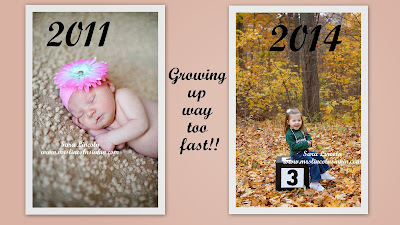 Oh my goodness, I can't believe that she is 3 already!! 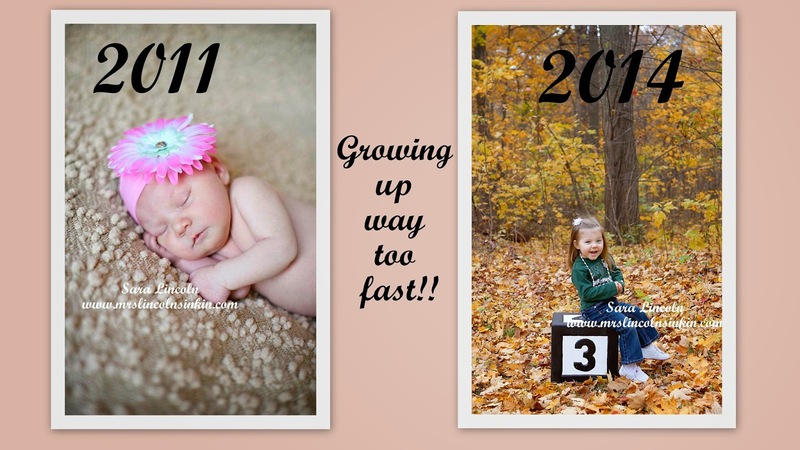 It seems like just yesterday we were welcoming her into the world. 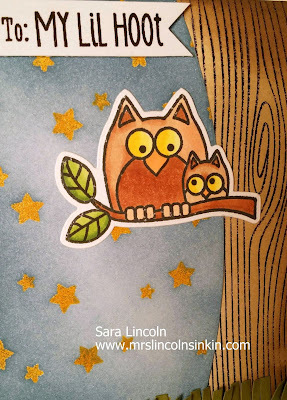 Emma and I really like owls so I decided to use this cute set by Hero Arts called Little Hoot. It has a coordinating die that you can get to make sure that your image(s) gets cut out perfectly. I colored my little guys in with some Copic markers (I can't remember the number of the colors). My card measures average size of 4 1/4" x 5 1/2" and is in Whisper White. I used my Ranger Ink Applicator and my Faded Jeans Distress Ink to shade in my background color. I love Distress Inks!!! 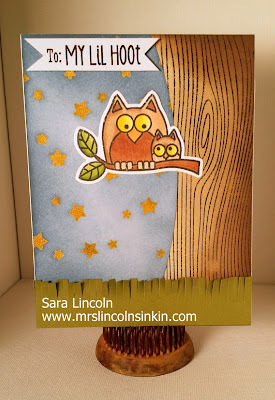 The inside of my card is using a sentiment that is also from the Little Hoot set... except the Happy Birthday... that is a single stamp that i have had for years!! With that being said... I have been thinking long and hard about the direction that my website is or has been going... as well as my crafting in general for that matter. I began crafting/scrapbooking forever ago, it was my hobby... my release. Well, I have found that lately my "hobby" has been feeling more of a job. Don't get me wrong, the amazing people that have turned their love for crafting into a business... i think that is wonderful and in ways I am jealous, however for me and being a Stampin' Up! demonstrator i find that i am limited to using only their products, which are WONDERFUL and I really enjoy crafting with them. But, there are so many other items out there that I love and enjoy using. While getting creative with those items, I always want to share them with you all, but don't because I want to make sure that i showcase all the wonderful products that SU! has at that current moment. Well, from now on, I am going to be showcasing my projects no matter what items they use. Whether it be SU!, Hero Arts, Lawn Fawn, Bo Bunny... the list just goes on and on:) When i first originally created my website I wasn't even a SU! demo yet. I created it to just so my love for crafting and to hopefully give inspiration to others that also enjoy crafting... therefore that is going to be my focus from now on. To get back to the roots of by website if you will:) I am still going to be a SU! demo (however i am sure that there are a few that are not going to agree with what i am doing), but i have to do this for me while i can. You are still going to be able to order from my Online store 24/7, just click on the link below every post or the shopping cart that is in the right hand column of my site.